I became a fan of Laurel Corona's when I read her novel, Penelope's Daughter last year and so when the opportunity came to me to host Laurel for her new release, Finding Emilie (release date April 12th), I was all over it!! Laurel has also graciously offered up a signed copy of Finding Emilie to one lucky winner, so make sure to enter at the end of this post! When Emilie du Chatelet died suddenly a week after giving birth to a daughter at age 43, Francois Maire Arouet de Voltaire was so beside himself with grief that he flung himself down a stone staircase at the place of Lunéville, where Emilie had spent her confinement. “I have lost the better half of myself,” he said, mourning the passing of the woman who had been his champion and his challenge, his lover and his muse. “She is a great man whose only fault is being a woman,” Voltaire once wrote in a letter to a friend. Though today we might cringe at such a statement, at the time it was the supreme compliment, meaning that the only limitations on this remarkable woman were those imposed by gender in French society of the time. They were in some ways a strange pair and in others perfectly suited. Emilie was a titled aristocrat by marriage to the Marquis du Chatelet. 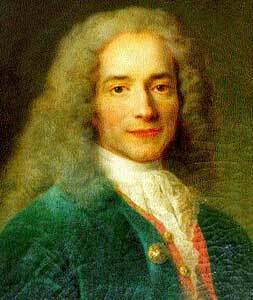 Voltaire, for all his caustic humor and troublemaking, very much wanted the approval of social superiors. She was statuesque, he was wiry; she was fashionable, he stuck to outdated styles; she was sexual and sensual, he a hypochondriac and frequent complainer about problems with his--shall I be delicate?--frequently flaccid member. Their love affair was probably never torrid, but I imagine there was a great deal of passionate energy (and relief) in being with a partner who was really, truly an equal. They lived together for roughly fifteen years at Emilie’s husband’s ancestral home at Cirey, in the Champagne region, near the border of what was at the time the semi-independent Duchy of Lorraine. There in this remote part of France, they amassed a huge library--larger than any French university of the day--conducted physics experiments, collaborated on works of philosophy and science, fought like cats and dogs, and entertained many of the prominent thinkers of the day. What did Emilie’s husband think of all this? He suggested it! When Voltaire was threatened with yet another stint in the Bastille for his acid pen, the marquis got permission to have Voltaire live under loose house arrest at Cirey, presumably far enough from Paris to stay out of trouble. The marquis was home whenever he could break free from obligations at Versailles or leave the regiment he commanded. He and Voltaire were great friends, and the marquis intervened for him on several occasions when Voltaire’s pen got him in trouble with church and government censors. Emilie’s marriage was one of convenience. Only discretion, not fidelity, was expected of either spouse. The marquis also had many affairs. Furthermore, Voltaire was very rich, largely from having found a loophole in the French lottery. 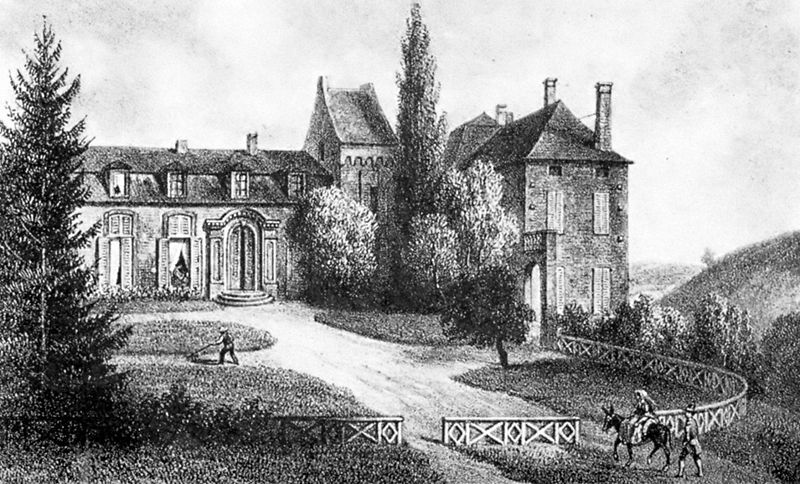 The chateau at Cirey was dilapidated and seldom used, and Voltaire expanded and renovated it at his own expense. What’s allowing a little pillow time with his wife, compared to getting a refurbished chateau? Though the daughter she died after giving birth to is the protagonist of FINDING EMILIE , I knew that without her mother, Lili is just a girl growing up in a difficult world. It’s her mother who makes Lili’s story special. I knew I would need to find a way to tell Emilie’s story too, despite her having died years before the novel begins. I did this by writing short scenes based on the facts of Emilie’s life, particularly her relationship with Voltaire. These scenes appear between chapters of the novel, and cover their first meeting, the energy of their early relationship, their scientific work and the quarrels they had, life at the chateau at Cirey, Emilie’s decision to publish scientific works on her own, and my favorite scene in the book, a stagecoach accident they had while traveling between Cirey and Paris in the winter. The accident is included in the memoir of Sebastien Longchamp, Voltaire’s valet. A wheel is thrown, sending the carriage into a ditch. Emilie and Voltaire are unhurt, but must wait for rescue in darkness far from any town on a frigid, clear night. Emilie and Voltaire are past being lovers by now--in fact, Emilie is pregnant with the child of a handsome soldier and poet, Jean Francois de Saint-Lambert. With the intimacy of old friends and soul mates, they settle onto the snow in a makeshift bed of furs and blankets. There, they lie, looking up at the stars and talking for hours. Imagining what they would have talked about, and how it would have felt to be together, so alone in the vast universe, was one of the great joys of writing this book. Emilie and Voltaire were the better halves of each other. Their deep bond survived even their notorious squabbles and other affairs. They were life companions in the deepest sense of the word, and, as Lili finds when she seeks out her mother’s old friend, he was loyal to her until the end. A HUGE thank you to Laurel, both for writing such a phenomenal post and for her generosity in providing for the giveaway! I can't wait to read Finding Emilie and learning more of her and her relationship with Voltaire. For more information please visit Laurel Corona's WEBSITE. 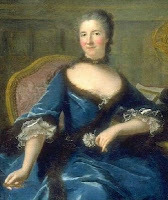 Stanislas-Adélaïde du Châtelet, known as Lili, is a thoughtful and serious girl growing up as the ward of a Parisian noblewoman, Julie de Bercy. 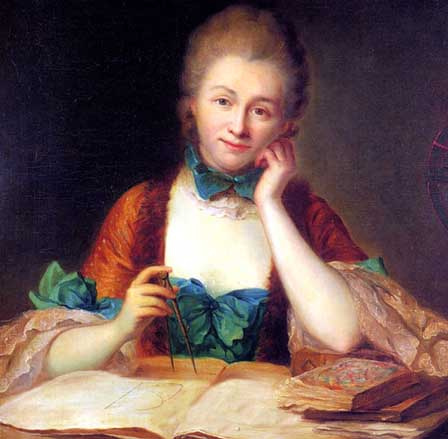 Madame de Bercy, a friend of Lili's dead mother, the brilliant and controversial scientist Emilie du Chatelet, has a daughter, Delphine, the same age as Lili. Though they could hardly be more different, the two girls grow up as sisters, steadfast friends, and confidantes. Lili can never understand Delphine's fascination with frivolous things like beautiful dresses, perfect curtsies, and fairytale endings. She wants the world of the mind, a life in pursuit of the truth about nature and people. Instead, she boards with Delphine at a convent school where independent thinking is punished, and she endures excruciating comportment lessons with one of the Châtelet relatives, the prim and judgmental Baronne Lomont. It is clear to Lili that she is expected to be satisfied with having no goals in life other than to be a supportive wife, charming conversationalist, and pious mother. Home at Maison Bercy with warm and free-thinking Julie, whom both Lili and Delphine call Maman, Lili is encouraged to be herself and use her mind. Julie is one of a small group of salonniéres in Paris, noblewomen who open their homes at certain times each week to artists, writers, and the group of French thinkers known as philosophes. Here Lili is exposed to the radical and revolutionary ideas of people such as famed naturalist George-Louis LeClerc (better known as Comte de Buffon), encyclopedist Denis Diderot, and philosopher Jean-Jacques Rousseau. But Julie cannot indefinitely hold off the pressure to conform to social expectations. In their teens, both Delphine and Lili must prepare for presentation at Versailles, followed quickly by marriage. As the world closes in on Lili, she decides that knowing more than the sketchy details she has been told about her mother's life may provide her with a better sense of herself. Hoping that this knowledge will help her chart her own future, with Delphine's loyal help, Lili ventures out to find the people and places central to her mother's story. Set in France during the last decades before the French Revolution, Finding Emilie explores the complicated tensions between the frivolity of court and the serious pursuit of scientific knowledge, and the perils of being caught between the demand for conformity and the need to release and fulfill one's genius. Through Lili's discoveries, Emilie du Châtelet speaks not just to her but to us, about remaining true to ourselves regardless of our circumstances. - Giveaway ends on April 21st. Thanks for the giveaway! I had requested a copy of this book from a blog tour group, but didn't get it. :( I love historical fiction, particularly about the 18th century, and Voltaire is one of my favorite authors. I can't wait to read this one either!!! There are just so many wonderful books coming out, and I cannot wait to read more about Emilie! Also, I tried to share the giveaway on Facebook and it would not allow me to do so. It said that it was being blocked for spam information and could not go through. What should I do to share? I am excited for this book! I loved Penelope's Daughter. Please enter me for the giveaway. Shared on Twitter - http://twitter.com/#!/dolleygurl/status/56110463162916864. Yay, yet another awesome book I can't wait to read, and another awesome giveaway! :) Thanks for the chance to win a copy! Emilie & Voltaire's relationship sounds really interesting. Sounds like a great novel, and I would love to know more about Voltaire. Thanks for the giveaway. Voltaire's works were so cynical, I would love to read about the woman who moved his heart. And the mores of that time were just as loose as they are are today--only we marry for "love". This book sounds great! I also loved PENELOPE'S DAUGHTER, so I know this one will be a hit! Thanks for including me in the giveaway! Sounds really good! Please enter me. What a fascinating story. We know the names of people famous for their role in history, literature, science, the arts, but seldom know much about their personal lives. We read much about the Royals and those close to them. The wealth of books in the past few years about these "other" people has given us a broader view of life and society in the past. They have also fleshed out these figures and made them real to us beyond their title of artist, writer, or philosopher. It is nice to find out about these women who didn't let the restrictions of society prevent them from becoming who they were meant to be. I tweeted this giveaway as pbbearclaw at 11:17 PM on 4/7. I shared this giveaway on Facebook as Patricia Barraclough at 11:19 PM on 4/7. Sorry I didn't get this all in one post. Such an amazing woman in history. I do so look forward to being able to read this novel. This sounds like a really good book. I read Candide in college and really enjoyed it. It's very funny actually. What an interesting story! I'd love to read it! THANKS for the giveaway! Emilie sounds like a fascinating person and I would love to read more of her story. Thanks for the giveaway! Oh, my gosh! I totally loved reading even this interview, so I know the book needs to be on my shelves, too! I love historical fiction, especially when it is truly based on facts. Reading of Emilie's and Voltaire's relationship, so wholly unconventional and yet so true, would, I think, be a good experience. many congrats & good luck to you, Laurel!!! i can't wait to read Finding Emilie!!! Now this is what I am talking about! HF about characters I know nothing about about but have heard of, Voltaire. I read his work way back when and actually enjoyed it. Congrats on the new book and I look forward to reading it. Sounds excellent! I would love to win this one :) Thank you for the opportunity! Love this time period, so many wonderful books on your site, not enough ttime! Historical Romance Fiction is my favorite genre'. This is likely to be a wonderful read. I forgot to give my email address.. Wow...I added this giveaway to my sidebar and then forgot to leave comments...lol That's what happens when you have so many fabulous giveaways...thanks Amy! Oh yeah I've added this giveaway to my sidebar. Emilie was one of the most capable, ambitious, and interesting woman I've read about in history. Combine her life with my favorite, Voltaire, and it's perfection! I will add to fb feed daily for a chance to win this most coveted book. Ooo, this is a time period I'm not super familiar with. It sounds fascinating! Thank you so much for these giveaways! Refreshing to read about lesser known characters in history. Sounds good! Thanks for the giveaway!